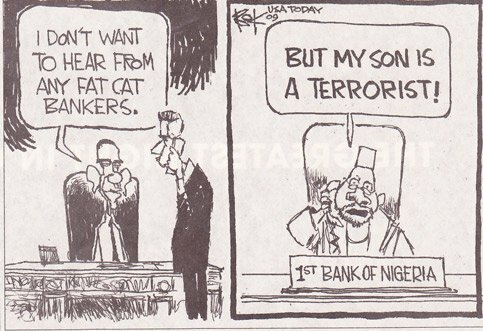 HILARIOUS: Cartoon of the Week! Another African country that you can put in the cartoon in place of Nigeria is Kenya. Someone wrote this previously here, but it is too good not to write it again – SOMEWHERE IN KENYA A VILLAGE IS MISSING ITS IDIOT. I’d like to get that for a bumper sticker, but I don’t want to incite some lefty into destroying my car. You can almost always tell a libtards car from a distance. The massive amounts of bumper stickers with walking fish, peace signs, or coexist all over the rear end. It usually has some type of body work needed as well. Maybe some of us are kicking them in the doors,lol. The next panel of the cartoon could show B.O. accepting the call because he thinks it may be a campaign donor. Joe – I know what you mean. Out here is southern Cal. there are still people sporting their ‘Gore for Pres’ bumper stickers on 30 year old cars like Volvos. You know why they have so many bumper stickers? It is to hide all of the bondo, primer and dents. Recently thousands of air bound holiday travelers to the U.S. were suddenly inconvenienced due to an attempted bombing attack by deranged muslim terrorist. The huge delays caused flights to be missed or cancelled, passengers to repack items that could no longer be carried on board aircraft and heightened security measures that made the use of an aircraft restroom or movement within the plane prohibited one hour before landing . Ultimately, many people had their holiday ruined, as airports could not cope with the large amounts of passengers who needed food, restroom facilities and lodging. All of this occurred while muslims in your community continued to eat, sleep, relax and freely enter their mosques to worship and ‘curse’, in some cases, the Western countries that have graciously hosted and accepted them. ENOUGH! The Fort Hood terrorist attack, that has sense ‘faded’ from the news, was STRIKE #3. How many more must we incur or endure? WE WILL BE INTIMIDATED BY THREATS OR ACTS OF TERROR ANY LONGER THAT IMPEDES OUR FREEDOM! 1.Call friends or neighbours (i.e. church members, civic groups, etc.) that you know that were personally affected by this event and organize a flash mob (in retrospect everyone was affected worldwide). It won’t take long to get sympathizers in the aftermath of what could have been a potentially deadly event. Definition: Flash Mob- a group of 10’s to 100’s of people who momentarily gather at location to perform an act (i.e. protest, dance , demonstration, etc.) that then disperse as suddenly as they gathered. 2.Find the nearest local mosque, Islamic centre or Islamic school and look up their local prayer times mainly Friday evening, religious events Ramadan, Eid. Bring your vehicles (i.e. trucks, cars, vans buses) and travel around the streets that enter into the mosque entrance, if permissible, stop your vehicles get out and hold up the flag of your country, sing the anthem of your country and get in your vehicle continue to drive for about a 20 minutes or so,- then leave. Print a leaflet stating “We Will Continue This until YOU Learn … YOU WON’T KNOW WHEN OR WHERE” leave them at the scene. Stick your country flag into the ground near the scene, if permissible. The heavy traffic delaying entry into these facilities will most certainly send a clear message. Slow moving traffic and congestion is not a legal issue. The right to protest is a given right in civilized democracies. 3.The more people that come the more impact this will have and the more emphatic the message. 6.Good Luck and let’s hope this catches on like wild fire. We the citizens need to send a CLEAR message! 7. Send these islamic institutions (i.e. C.A.I.R, YMA, )emails, snail mail, and phone calls(use a public booth, if possible or disposable phone) of disapproval – millions of these send a CLEAR message! Keep these people on edge, like they do us; not knowing when or where the mob will show. 8.JDL Disclaimer: Try and Keep it LEGAL! Be prepared for a possible confrontation; YOU have the right to self-defense within the confines of the law! Short on memory or just awareness? countless embassy bombings, murder of Israeli’s at the 72 Olympics…. The only thing that surprised me is (and much to his credit) this cretin’s father doing his utmost to turn the miscreant in and no one in this administration does a damned thing about it. What’s next after the under-roo bomber? the suppository bomber? Just one Moslem has tried to do this? Have you been using your head as a cinder block for the past 15 years? JDL – some very good ideas. I’d also add that if you have the misfortune of living next door to a mosque, there are many things you can do (within the law?) to anger these ragheads. Noise ordinances are a good start. I’m pretty sure that Black Sabbath, Metallica and Iron Maiden are not on the muzzie song list during their cult meetings. I think rich people don’t get appreciation when they do have a conscience. In Obama’s world, all fat cat bankers appear to be the same. That’s the extent of his education from Paul Dorhm and Bernadine Ayers. The US was just fortunate to escape a massive disaster last weekend. You realize the Obamunists told you there is no ‘war on terror’. Relax, watch some MSNBC, drink the kool-aid, eh. We should abolish all laws and start our own Citizen Justice, just like yemen. IT SEEMS THAT MANY CONSIDER THE FATHER OF THE “PANTIE” BOMBER TURNING IN HIS SON WAS OUT OF BENEVOLENCE. I BELIEVE THE KORAN MAKES IT CLEAR THAT MUSLIMS MUST WARN THEIR ENEMY BEFORE ATTACKING. ISN’T THAT WHAT THE “PANTIE” BOMBER’S FATHER DID? PERHAPS THE FATHER IS FEATHERING HIS FUTURE NEST?